Immigrants rights’ activists had a lot of praise Friday for the Justice Department’s investigation into Arizona Sheriff Joe Arpaio, which alleged systemic discrimination against Latinos by the Maricopa County Sheriff’s Office. They had less praise for President Obama, whom they say is enabling Arpaio-style anti-immigrant local policing in the first place. “The Obama administration bears a lot of blame for what is happening here in Maricopa county,” said former Sacramento police chief Arturo Venegas, who now runs the Law Enforcement Engagement Initiative, a pro-immigration reform group. On a conference call with reporters, Venegas and other immigrants rights activists said the Obama administration’s use of the Secure Communities and 287(g) federal programs—both of which use local authorities to find and deport unauthorized immigrants—is a larger problem than Arpaio. “But for those programs we wouldn’t have the numbers of racial discrimination and proviling and violations of civil rights that we have, not only in Maricopa county but across the country,” Venegas said. A little background: Secure Communities is a federal program under which the indentifying information of anyone arrested in participating jurisdictions is forwarded to Immigrations and Customs Enforcement, which then checks their legal status. The 287(g) program allows ICE to work with local law authorities so that they can enforce federal immigration laws. On Thursday, Homeland Security Secretary Janet Napolitano announced that because of the Arpaio investigation, DHS would be ending its 287(g) agreement with the Maricopa County Sheriff’s office and “restricting” the county’s access to Secure Communities. Both programs predate Obama, but they’ve been especially effective during his tenure: Obama has deported more than a million undocumented immigrants during his time in office, without doing much to advance immigration reform. Immigrant rights activists argue that these federal programs are a huge part of the problem. Because local authorities know that under Secure Communities arrestees will have their identifying information forwarded to ICE, cops can racially profile, knowing unauthorized immigrants will be deported even if they weren’t committing crimes. Empowering local authorities to enforce federal immigration law through the 287(g) program encourages law enforcement to think and act more like Arpaio. “It was the climate set up by Secure Communities and the 287(g) agreement that created Arpaio,” said Salvador Reza, a Phoenix civil rights activist. The head of the Justice Department’s Civil Rights Division, Thomas E. Perez, stopped short of calling for Arpaio to step down during Thursday’s annoucement. On Friday’s conference call, Rep. Raul Grijalva (D-Ariz.) was far more blunt. 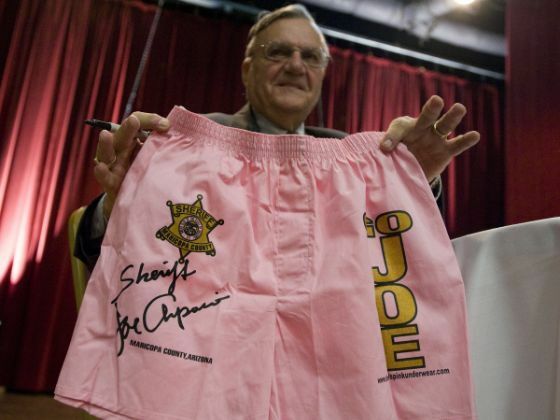 What Else Should Phoenix Sheriff Joe Arpaio Investigate?